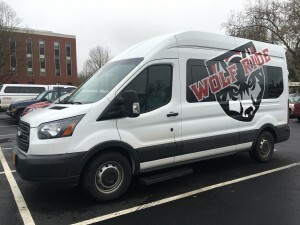 The mission of WOLF Ride: WOU’s Safe Ride program is to provide a complimentary and reliable shuttle service to students of Western Oregon University who would otherwise walk alone at night and risk their safety or possible assault. WOLF Ride provides a safer environment for all students by increasing public awareness of our services and the dangers of assault. Announcements: Service begins Monday, September 24, 2018. Be prepared to tell the driver whether you are alone or how many students are in your group. To request a ride, please call 503.428.7238. You must be a current WOU student. Finals Week / Spring Break Return Request Rides: Students can request a ride to and from Salem, OR ($10.00 cost per trip). If you would like to request a ride during Winter Term finals week (March 20 – 22, 2019) or Spring Break return (March 30 – 31, 2019), please complete our online request form or stop by the Vice President of Student Affairs office (WUC 203) for a request form. NOTE: payment must be received to confirm request ride. Payments can be made in cash, check, or charged to your WOU student account. If you have questions regarding the WOLF Ride program (no ride requests), please call the Office of the Vice President for Student Affairs at 503.838.8221. WOLF Ride is not to be used as a designated driver service. Intoxicated students will be refused service.